Find yourself sorting through our sinfully sweet flavors and don’t know how to make up your mind? Or are you curious what our alcohol-infused flavors look like? We’ve added a Sin City Cupcakes flavor guide so you can see how our scrumptious cupcakes look, per flavor. Sometimes our cupcakes have some seasonal garnishes and decorations, so they may vary from time to time. Cupcakes are frosted happiness.. Prepare yourself! A: We deliver TUESDAY through SATURDAY. We don’t offer Sunday or Monday deliveries. The only exceptions are pre-approved events or weddings (5 dozen minimum). Q: What times do you deliver? A: We generally deliver between 10am – 2pm. Our weekly delivery calendar is not confirmed until the week of. If you have a special request, please include this in your order. We try to accommodate as much as possible! Q: How much does delivery cost? A: We offer a FREE delivery to a majority of the Las Vegas valley & numerous hotels. There is a $5 delivery charge to the following hotels: Cosmopolitan, Venetian, Palazzo, Bellagio, Polo Towers, Elara, Mandalay Bay, NY NY & any restaurant establishment. There is a $5 delivery fee to East Henderson, Anthem, North Summerlin, North Las Vegas & Blue Diamond. *please note some delivery addresses located further from the Las Vegas Valley may have an additional delivery fee (based on distance). Order pickups may be accommodated with pre-approval, with a minimum order– this is not available every day. Q: Do you deliver to hotels? A: Yes we do. For hotel delivery we need the property name, the name that your room is reserved under & you do need to be checked in (or checking in THAT day). 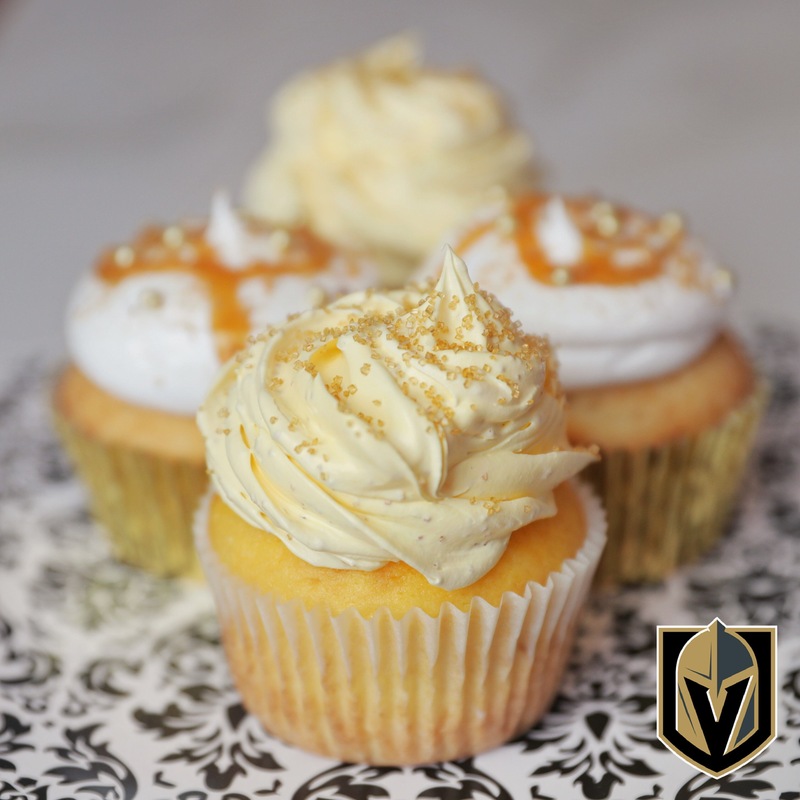 Your cupcakes will be delivered to the bell desk or the concierge under your RSVP so that you may then pick them up at your convenience, after they have been delivered. The hotel will also contact you on your room phone to let you know you have a delivery. Q: Do you deliver to home addresses? A: Yes we do. Please make sure that someone is home to accept your delivery during the delivery window. Please provide us with the gate code or key code, if applicable. Our delivery staff can call you when enroute if you would like. Q: Do you deliver to restaurants? A: Yes we do. There is a $5 delivery charge to any restaurant establishment. Please contact them prior to ordering to ensure they allow outside desserts! Include your reservation name as well as the time of your reservation. They will be delivered prior to your reservation time to the hostess at the restaurant. 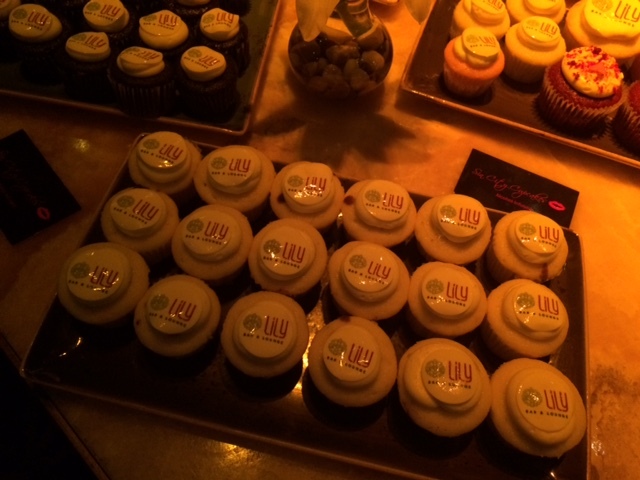 Q: These cupcakes are a surprise. I don’t want the hotel to call my room. Can this be done? A: Yes, we understand celebrations do require some planning. If you would like the hotel to NOT contact your room phone, please let us know so that we may include the instructions. Q: Can you deliver to my hotel room? A: For security reasons on both parts, no we do not offer room-delivery. If you would like your cupcakes delivered to your room, please coordinate this with the bell desk and concierge at your hotel. Each property handles this differently. 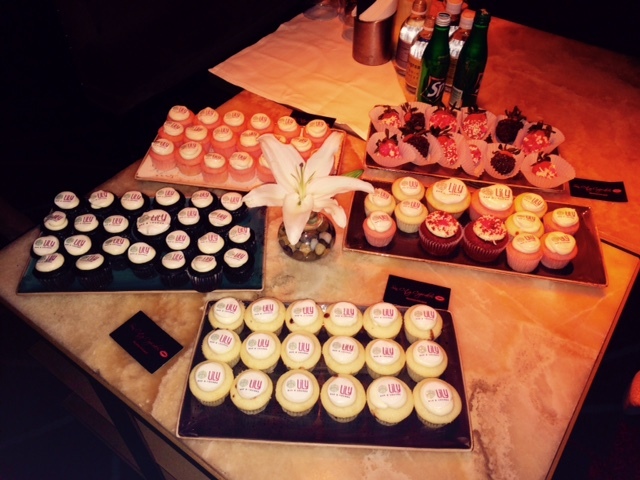 Q: I have plans in Vegas, I don’t want to wait around for a cupcake delivery. What do I do? A: Luckily for you, you don’t need to be physically on your hotel’s property to receive your delivery. With a correct RSVP name, the bell desk or concierge will hold them for you. Q: How do I know when my delivery has been completed? A: We will send you a delivery notification through a text message once your delivery is complete. If you don’t have access to text message, we can send you your notification via email. Just let us know! Q: I have not yet received my delivery yet. What do I do? A: Your delivery may be out for delivery up until the end of your delivery window. Check with your hotel first to see if they have been delivered. If not, please call us 702.776.0955 if your delivery is not at your hotel. 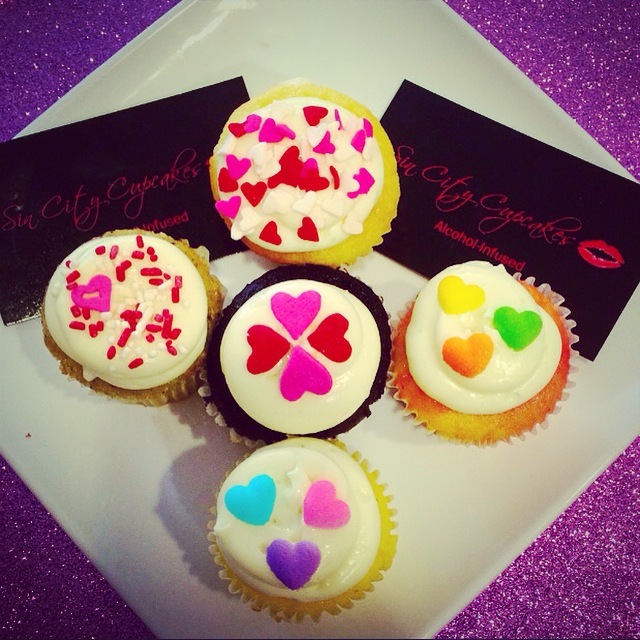 Please email us as well if we are unable to answer the phone: connect@sincitycupcakes.com. We may be out for deliveries or rushing to deliver your cupcakes if bad weather or unexpected traffic exists. Spring has already sprung and have we ever been ready! 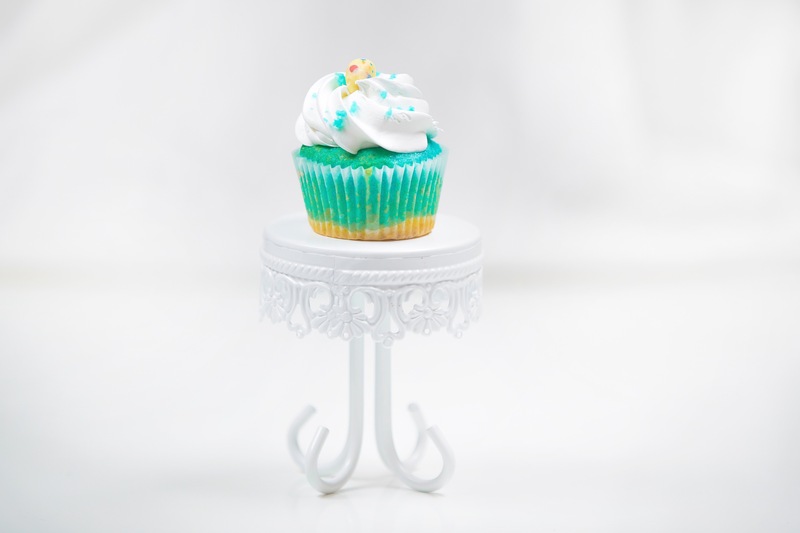 A blue curaçao cake injected with a banana & coconut rum filling, finished with our whipped topping. A real sweet treat that will have you feeling like you’re on an island get-away! Order this special tropical flavor before it floats away! In the flavor section, please list ‘Tropical Banana Splash’ as one of your selected flavors. You may choose (1) OTHER flavor to pair it with, within each dozen – (2) flavors per (1) dozen. 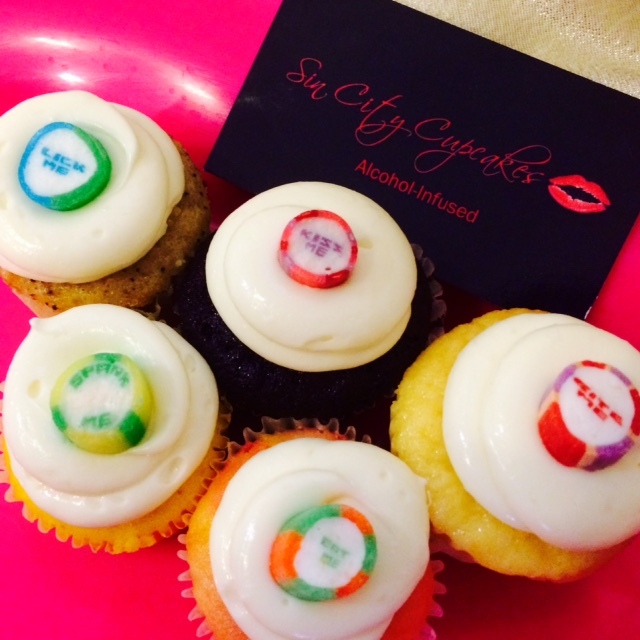 Don’t forget to place your order for some delicious alcohol cupcakes this St. Patrick’s Day! St. Patrick’s Day decorations are available for your special event, party, or just to celebrate the luck of the Irish! For the entire month of March, we have TWO limited edition flavors that we don’t offer throughout the year! Get your tastebuds on these tasty treats while they last! Irish Car Bomb – a St. Patty’s Day favorite! Our signature chocolate cake filled with Jameson Irish whiskey, Bailey’s Irish Cream & Guinness Stout beer! Twisted Pretzel – a cinnamon cake with a Guinness filling, topped with crunchy sea salt pretzels! Have a safe and fun-filled St. Patrick’s Day! We are so excited to announce that we are now offering custom edible logos that can be added on top of your delicious alcohol cupcakes! 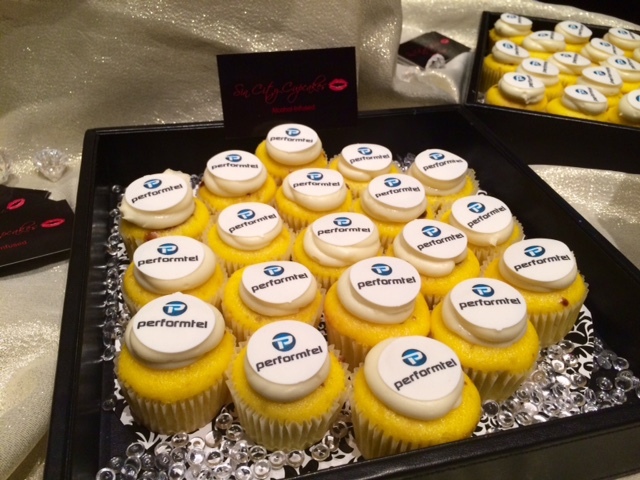 What is better than having your company’s logo on top of our cupcakes that you can eat? The possibilities are endless. 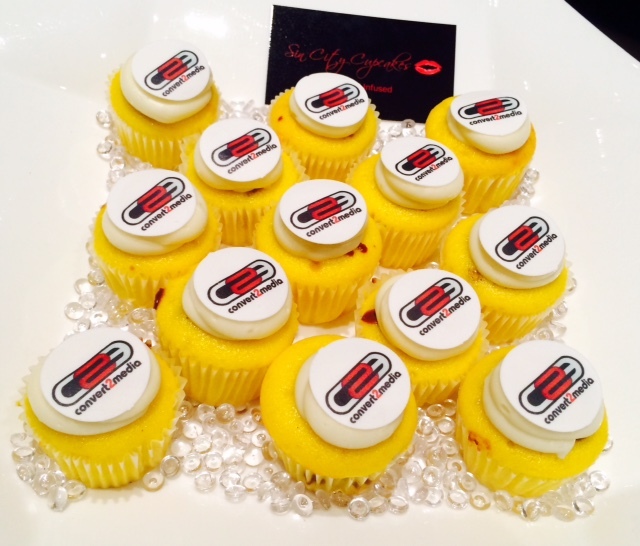 Whether you’re planning a special birthday, a catering request, corporate event, or exhibiting at a trade show, let Sin City Cupcakes create YOUR COMPANY’S cupcakes! 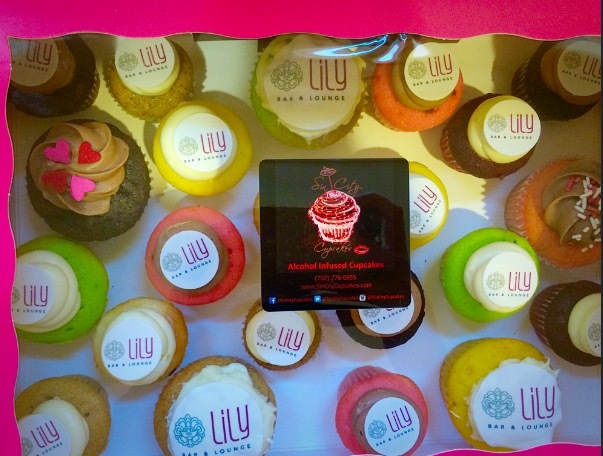 Custom edible logo printing will require about a week in advance order placement to ensure your delivery date. If the date is closer than a week, please ask us if we can rush order your logos! We don’t want you to miss out on this opportunity to show case your logos at your event! Perfect for parties & corporate events! Please call or email us to inquire about quantity and pricing for your needs. 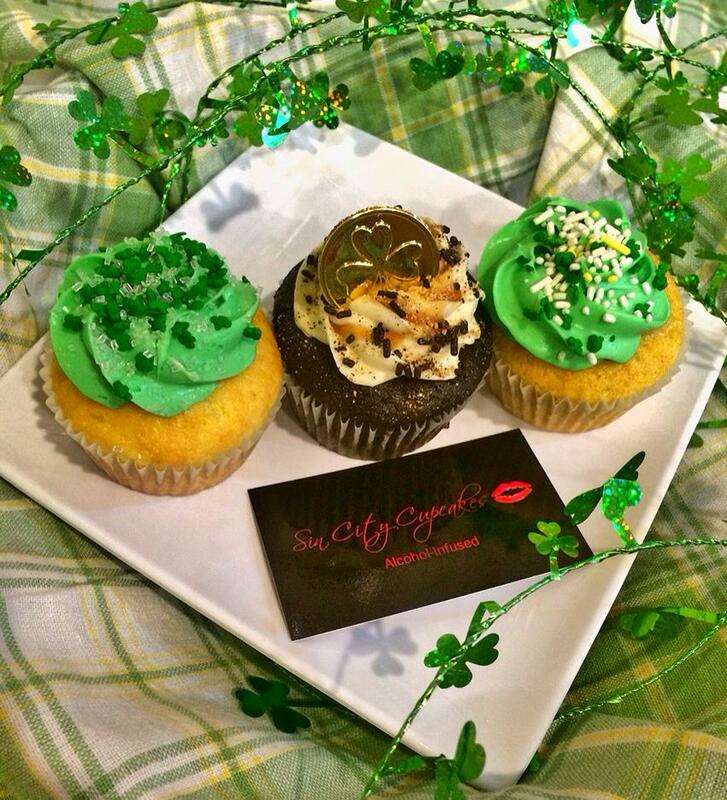 Be sure to keep up with us on social media to see the latest and greatest at Sin City Cupcakes! Valentine’s Day is already this weekend! Haven’t found a gift for your sweetheart yet? 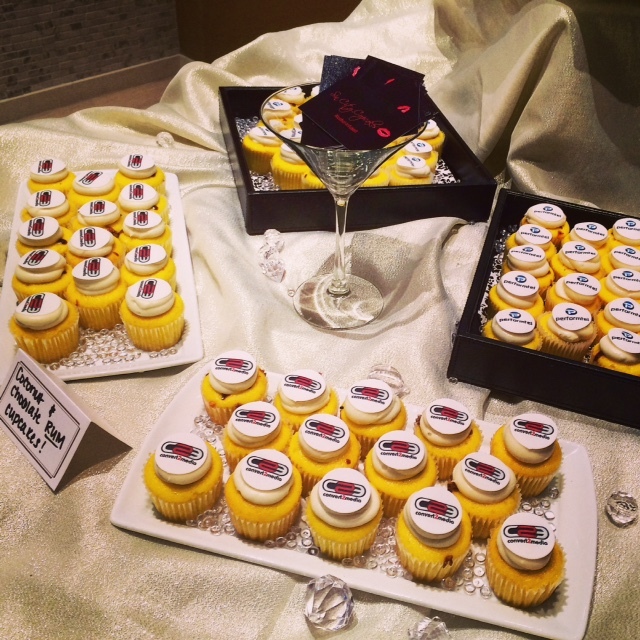 Instead of a dozen roses, how about a dozen alcohol-infused cupcakes? A sure way to spike your sweeties’ taste buds! Call us today at (702) 776.0955 to place an order or place one online through our online order form. We will contact you back to complete your order details! Valentine’s Day decorations are available as well! Make sure you note these on your order! Our limited edition FRISKY Valentine’s Day decorations! Either one you choose, they’re guaranteed to put a smile on your sweetie’s face! Remember all of our decadent goodies are baked fresh daily and made to-order… So please place your order within 48 hours of your desired delivery date. *Rush orders subject to availability and includes a rush fee. We can’t wait to help you celebrate this special day of the year with our tasty treats!